Michael Masilunas | ATI Financial Services, LLC. 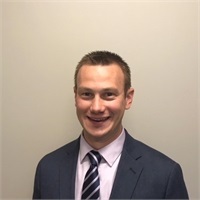 Michael received his Bachelors of Science degree from Penn State Behrend in May 2007, where he majored in Accounting and Finance. Michael is securities registered FINRA Series 7, Series 66, (held through Lincoln Investment) and insurance licensed. Although he has explored both the U.S. and international locations, Michael is proud to call Southwestern PA his home. He and his wife Alexandra currently live in Washington County.